I know Newtown was on everyone's mind today as we went back to school. It was hard not to think about as our day got underway routinely, just as theirs did on Friday. Luckily, none of my students seemed to know anything about it. I was very worried that one or two may know something about it and bring it up to those who did not, but it was a very normal day in our classroom. Normal was what I needed. Since I was home sick on Friday, I had been glued to the television watching the details unfold. 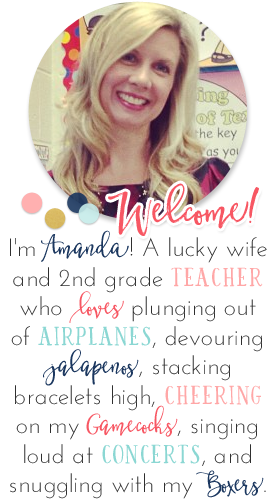 My husband was concerned with my "obsession" but it just hit so close to home for me, as a teacher. I know that there's nothing that we can do or say to take the pain away or truly help the survivors through this time. It is going to be a slow healing process for them. What we can do are small things. Things where we live. Things that may make a difference to someone, somehow. Things to bring happiness to others who may need it more than we know. So, for what it's worth, I'll be doing a Random Act of Kindness each day for the next 26 days (one in honor of each victim who lost their life in Newtown). Just a small gesture....a small way to honor those precious lives that were lost, and a way, to hopefully touch more lives. Who knows? Maybe one will reach someone who needed a smile or a kind gesture at just that moment. 14. Leave a joke to put a smile on someone's face with a note to "keep it going"
Do you have other RAK ideas? Are you interested in participating in 26 RAK for Newtown victims. I would love to hear from you. Let's work to make a difference in our communities. 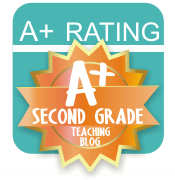 I would also like to share this blog post in case you haven't seen it. I read this on Saturday and woke up still thinking about it on Sunday. How I feel for this mother. We need to become active in changing laws - it is unimaginable that there is no place for families to get help for these "troubled" children before crimes are committed. As a teacher, I've seen these children. I've taught a couple of these children in my 15 years in this profession, and frankly, that terrifies me....enough to try to make a change. I'd love you to link up below and share your lists, and of course, use the button above and share this post url so others can link up, too! Hi Amanda, I'm a new follower. I was drawn in by your 26 Random Acts of Kindness and I think it's a fabulous idea. Thank you for this post Amanda. I need to feel that I am helping in some way and so wherever you are carrying out your 26 RAK's I will also be doing the same, it is a wonderful idea. I have been glued to my TV all weekend and found myself looking in the closet of my classroom today and thinking that I could never hide all my kids in there if I had to, it's too small. I've taught these troubled kids too in my 20 years in the profession and they need help now, not when it's already too late. Thanks so much for sharing your thoughts. 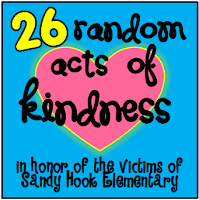 I love your idea for the 26 random acts of kindness. I've been telling my husband that I don't know what to do, but I feel the need to do something. I've even thought about driving to Sandy Hook to pay respect. But I want to thank you for your idea.... because you've helped me figure out something that I can do. I will start my 26 RAKS today as a way to pay it forward. I've created a post about it on my blog, so maybe we can bring awareness to others who would like to join in. Thank you again. Thank you so much for the lovely thoughts. I'm a follower from the old Second Grade Teacher's Club. I love your Random Acts of Kindness! Great ideas! This tragedy has hit home for me, too. I've just cried watching the news and reading stories about it. It is so tragic. My father-in-law asked me as a teacher if I can spot kids that are troubled and that I think might ever do something like that, and sadly, I said yes. You're right, there needs to be some help BEFORE they commit crimes. 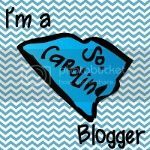 2013 Preview and a First to Guess it Giveaway!! Welcome Winter Sale & Friday Flashback Linky! Freebielicious Linky and Day 6 Winner! !